GRR is in the spacious back seat of a Maserati Quattroporte with Lorenzo Ramaciotti at the Earls Court Motor Show at the 2015 Goodwood Revival. Out through the Maser’s blacked-out rear glass, past the Ghibli parked alongside (for which he was also responsible) we can see a lot more of this man’s work displayed in a sea of red. 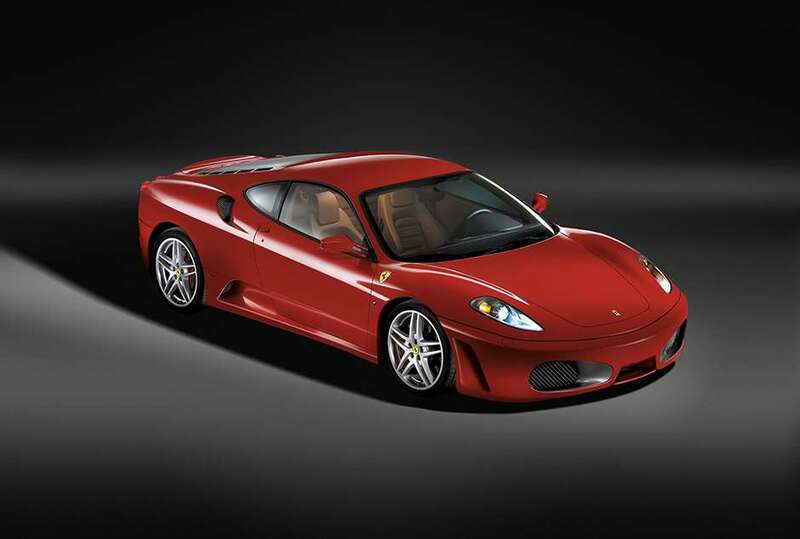 Including the Ferrari F40, F50, Enzo, 599 and 355. It’s Revival’s tribute to Ferrari of course but could just as easily be a Lorenzo Ramaciotti retrospective. Lorenzo is linked to Ferrari more than any other car company – when you have worked at Pininfarina for more than 30 years, 17 of them as director of design, it could be no other way. His personal tally is 30 production cars – not all Italian; remember the beautiful Peugeot 406 Coupe? – and 25 concept cars, memorably including the first that Pininfarina produced under his direction, the 1989 Ferrari Mythos. A passionate devotee of the Italian industry and the history of Italian car design, Lorenzo is for many the greatest Italian designer still working. 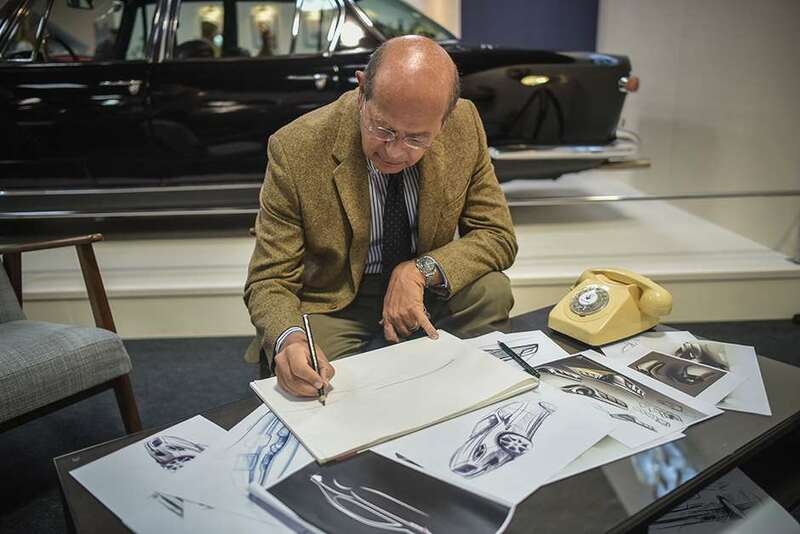 He left Pininfarina and tried to retire in 2005 but was called in to head up Fiat Group design two years later, a job that quickly expanded into design director for the newly-formed Fiat Chrysler Automobiles. Today, American Ralph Gilles has taken on that job and Lorenzo’s role is as special advisor to Fiat chief Sergio Marchionne. GRR suspects that, whatever his title, paper and pencils are always within his reach. He draws cars as spontaneously as others make notes. We haven’t seen all the new work created under his watch by any means: there’s still the Maserati Levante SUV and the production version of the Alfieri coupe to come, and the new Alfa Giulia – launched just last week at Frankfurt – is still to make it into the showrooms. Plenty to look forward to then, but this is Revival and wherever Lorenzo looks he is surrounded by exquisite sports and racing cars. And so many of them do seem to be Italian…. Why do Italian cars always seem to be the best looking? I love Italian cars but I don’t think we have the monopoly on good looks. There are many other cars that are beautiful: E-type and XK120 Jaguars, Lotus Elite, 300SL Mercedes, and BMW 507. Maybe in Italy there is more consistency. Other countries are more mixed up. Okay, so what’s the one car at Revival you would most like to drive home in? The Ferrari 250 GT SWB. It is the epitome of mid 1960s Italian design, and it has balance, proportions and simplicity. In my memory it is the best car in the world. I remember as a boy seeing a silver SWB in my home-town of Modena and saying it was so much nicer than any Maserati. It was not a good thing to say because I was with my father and his friends the Orsi family (who owned Maserati) at the time! 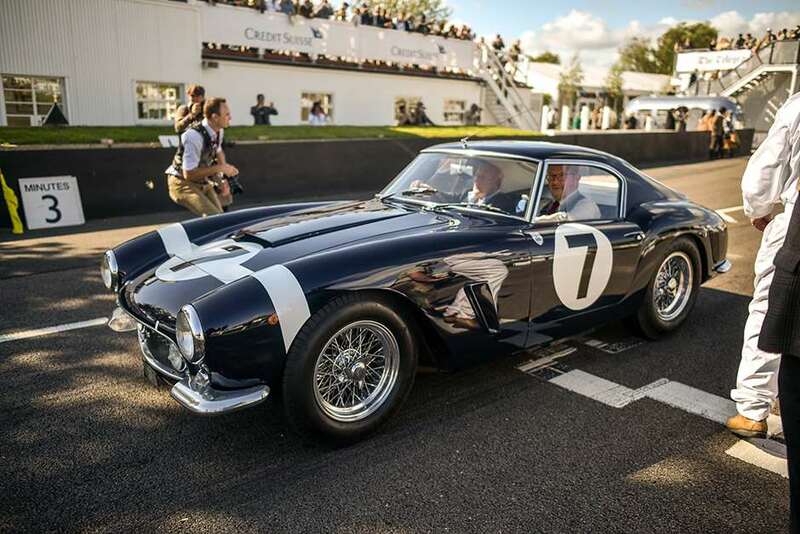 It was fantastic to see Sir Stirling Moss driving the blue Rob Walker car again. Your career is 42 years and counting – what are your five highlights so far? The first was to be hired by Pininfarina in 1973. That really opened my world and gave me a perspective I didn’t have before. Second was when I was given responsibility for the direction of design at Pininfarina in 1988. Then from 2007 my great adventure with Fiat started, and the merger with Chrysler. I didn’t love Fiat much before but it was changing and this was like a second life for me. 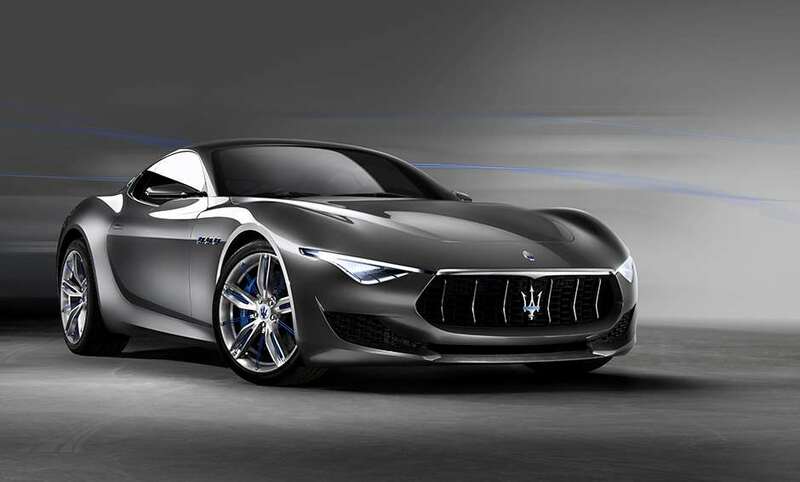 Number four I would say is the Maserati Alfieri and my fifth highlight the new Alfa Romeo Giulia. 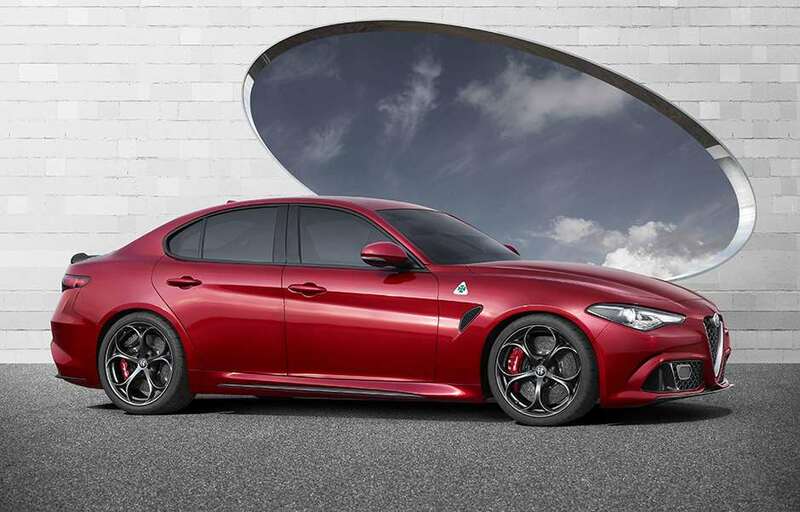 Giulia is more than the introduction of a new model, it’s Alfa Romeo starting over. In your new role as ‘special advisor’ can you say what you think with impunity? Yes in the sense that I can look around in all the studios without having responsibility for what’s coming out. After 42 years that’s quite a relief. It’s not easy to stay at the edge of creativity for such a long time. Is the future of Italian design in safe hands? Yes it is because the people are so good. When I came to Fiat in 2007 I didn’t know what I would see there. I opened the door and because design in Fiat had had its ups and downs, it was not clear where the direction lay. But they are very talented people and they just needed a lead and the trust of the management. Design is a very fragile activity. We are not selling horsepower or kilograms, we are selling beauty and you can’t measure beauty. Designers need a lot of support from the management to bring out the best ideas. Should Italian cars become more Italian? In previous times country boundaries were much stronger and it was easier to keep a national approach to design and engineering. Now everything is more international and the recipe of Italian cars, of gorgeous design and high performance is more or less the recipe of all successful cars around the world. With the Maseratis and Alfas like the Giulia we are starting again to be proud of our Italian heritage and to develop more Italian character. What was the mission with the new Giulia? It was to embody the values of Alfa, to make a statement of what Alfa values are and have been through the years. It is unique that a brand like Alfa Romeo, which has been going up and down over time, still has a very loyal and strong following. It’s the same with Maserati. The aim with Alfa is to replicate what we have done with Maserati but on a bigger scale. Where is the Alfieri project is up to? The car I love the most today is the Alfieri because it is beautiful and it came out late. It’s like having a son when you are in your 60s. It was a fantastic shot of adrenaline for me. Everyone in the company is willing for us to make it. We have already developed the roadgoing version of the concept car and are investigating the best way to make it… at the same time as making money for the company. We are very much keen on making cars that bring back money. And what about the Levante SUV? It will be our next new Maserati, out in the first half of next year (Geneva Show debut – ed). The lines are settled and we have started to make the first cars. I like it very much because it’s unique. I always say Italian cars are made mostly by proportions and simplicity, and the Levante amongst SUVs has unique proportions with its very long hood and fenders and cabin towards the rear. It is relatively low and wide and has a very dynamic stance. It will be something different for the SUV class, right at the edge of sportiness, much more so than competitors. How have you enjoyed the Revival weekend? On Friday I had dinner with Lord March, Saturday was the big party, today is a Maserati lunch and then I will watch the racing. The perfect weekend? I think so. I have been coming to the festival for 15 years and love the event. Best thing about Revival for you this year? I fell in love with cars in the ‘50s and ‘60s so it is always a personal pleasure for me to be here. I liked very much the Bruce McLaren memorial because it brought out cars that made up the history of racing at that time. And I like that McLaren grew after surviving the death of its founder so early on – much like Maserati. I also enjoyed the St Mary’s Trophy race. 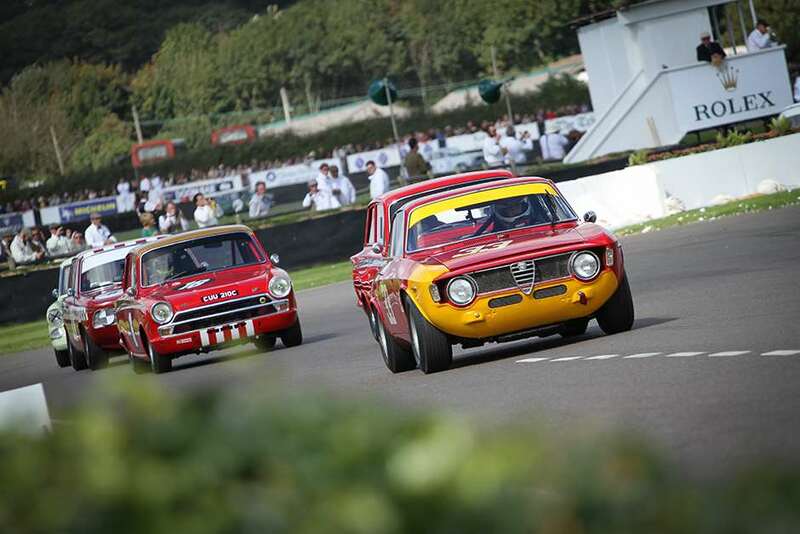 The guy with the Alfa GTA racing bumper to bumper with the Lotus Cortinas was fantastic. Are you a big historic racing fan? Frankly speaking I am not. It is a pity to put at risk such precious things. But once you are here and see them racing for sure you are brought back to the passion and thrill of the racing. What’s in your garage at home? I have just sold my Ferrari 430 (another one of his designs – ed) and ordered an Alfa 4C. The 4C is closer to my driving abilities. Ferraris today are really too much. I think an average driver can use 20 per cent of their capability. I also have an Alfa Giulietta, the 1976 Mercedes 280 SL that I bought more than 30 years ago, and a 1956 Fiat Abarth 750 Zagato ‘double bubble’. It’s a very lovely car and every year I tell myself I will take it to the Mille Miglia. I enjoy driving but I never figured to be a racing driver. I am too scared. Lots of designers do race these days; 95 per cent of car designers are car enthusiasts and love of speed. But that doesn’t mean you automatically have the talent and guts to drive a racing car. Giugiaro never raced and he’s designer of the century.